Name this folder: BloodRayne_DVD. This will be the name (Label) of our DVD. 3) Copy all the contents from the BloodRayne CD1 to the BloodRayne_DVDBR1 folder. 4) Copy all the contents from the BloodRayne CD2 to the same BloodRayne_DVDBR1 folder. There are no files to overwrite. 5) Copy the BloodRayne Update Patch to the BloodRayne_DVDPatchesBR1 folder. 7) Copy the BloodRayne NoCD Crack to the BloodRayne_DVDCracksBR1 folder. 8) Copy all the contents from BloodRayne 2 CD1 to the BloodRayne_DVDBR2 folder. 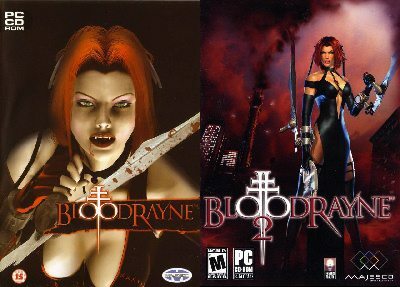 9) From CD2 copy the data3.cab file to the same BloodRayne_DVDBR2 folder. 10) From CD3 copy the data4.cab file to the same BloodRayne_DVDBR2 folder. 11) From CD4 copy the data5.cab file to the same BloodRayne_DVDBR2 folder. 12) Copy the BloodRayne 2 Update Patch to the BloodRayne_DVDPatchesBR2 folder. 13) Copy the BloodRayne 2 NoCD Crack to BloodRayne_DVDCracksBR2 folder.